Well, these pictures have gone everywhere. I’ve had talk shows, US Late Night and Morning shows, etc. asking for use of the pictures. On Twitter, “groin” and “hydrant” were trending. So bizarre. I guess that all of those years of hard work and money spent on my education were all in preparation for the moment that Rob Ford ran groin-first into a fire hydrant. First of three – Toronto Mayor Rob Ford walks into a fire hydrant while celebrating at Maple Leaf Square in Toronto after the Canadian men’s hockey team won the gold medal Olympic final 3-0 against Sweden in Sochi, Russia Sunday morning, February 23, 2014. 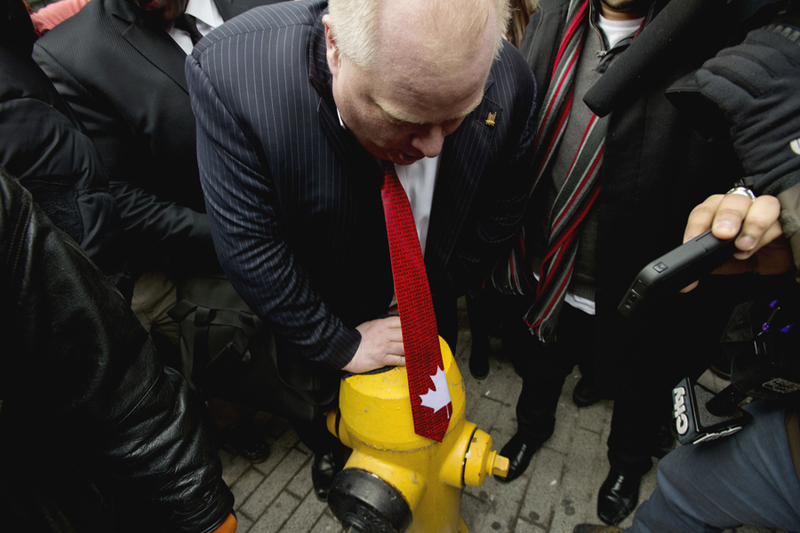 Two of three – Toronto Mayor Rob Ford holds his groin after walking into a fire hydrant while celebrating the Canadian men’s hockey team’s Olympic gold medal-win over Sweden in Sochi, Russia Sunday morning, February 23, 2014. Three of three – Toronto Mayor Rob Ford holds his groin after walking into a fire hydrant while celebrating the Canadian men’s hockey team’s Olympic gold medal-win over Sweden in Sochi, Russia Sunday morning, February 23, 2014.